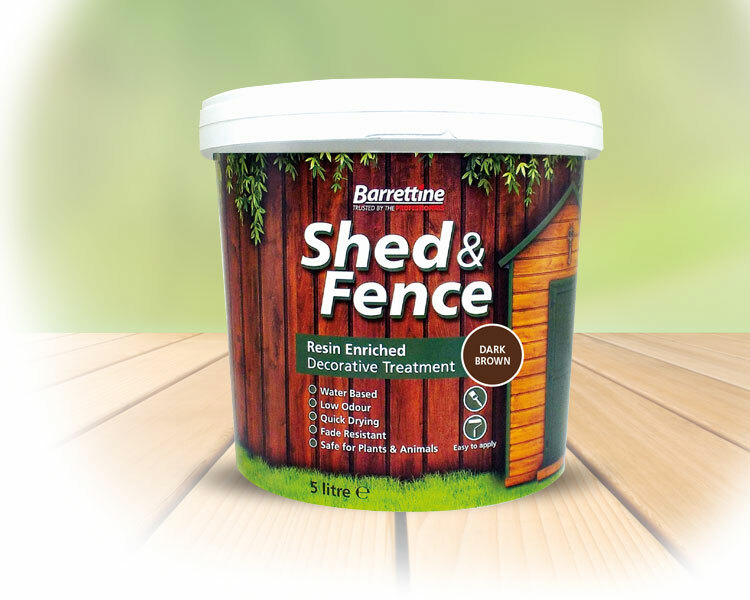 A water based decorative treatment for rough, sawn or smooth timber such as fences, sheds and trellis. The low odour formulation is harmless to plants or pets when dry. Ideal for use over pre-treated, pressure treated and preservative impregnated timber structures. Available in 5 attractive colours. Colour: Dark Brown, example below. Colours may vary slighlty from batch to batch and on different wood types, always test on a small section first that is out of sight. Harmless to plants and animals when dry. Attractive colours - Dark Brown, Evergreen, Harvest Gold & Red Cedar. Ensure wood to be treated is dry, free from diand repellent coatings such as paint or varnish (remove and sand down as required). Coverage. Normally up to 6 sq metres per litre. Apply by a generous brushing evenly over all areas of timber and finish by brushing evenly along the grain. Do not apply in temperatures below 5 celsius, or if conditions are damp or rain is likely within the drying times. 1 coat usually sufficient on rough/sawn timber. 2/3 coats on smoother timber. Drying times. 24 hours at ambient temperatures. Brushes can be cleaned with Barrettine Bio Spirit. Spillages on plants, clothing or surfaces should be rinsed and cleaned up immediately whilst still wet. The delivery charge is calculated once we receive your quote request, simply add items to the cart and submit, then we will contact you regarding delivery and the order. We operate in the South, South East of England and normally only deliver within these areas. However, we can sometimes offer deliveries direct from our suppliers on certain products so, if you send us your enquiry we will let you know whether we can do this for you. At Challenge Fencing your items can be delivered to your address or you can collect them for free from any of our fencing branches. In store we will apply the delivery cost to your quotation generated by the website; this is to ensure you get correct delivery cost. Our delivery service varies from the normal 1 - 2 working days to 4 - 5 working days depending on the time of year and demand levels. Some products made to order can take up to 10 working days to deliver depending on demand levels. We cannot offer timed deliveries due to the nature of some of the products being carried and that where possible we try to use the most efficient routes to keep fuel/delivery costs down. Challenge Fencing deliver across the south east directly from your local branch. Our delivery areas are divided into zones by post code, based on the distance away from your local branches. Our delivery charges are based on the area/zone that your post code is in from your local branch. We usually deliver your goods to the kerb side or a driveway entrance. The delivery vehicles can be heavy lorries that can damage private driveways by cracking paving slabs or light weight drain covers etc. We strive to carry out our deliveries Monday - Friday, between 8am - 4pm, except on UK Bank Holidays. This can of course vary depending on things like traffic and other exceptional circumstances beyond our control. Where possible we will contact you prior to us arriving with a delivery time window. If you have chosen to collect your goods from us, please wait until one of our team has contacted you before visiting your local branch. If you have any questions please don't hesitate to contact your nearest branch. This product is not available in this colour/size combination. Please select an alternative size or colour for this product.